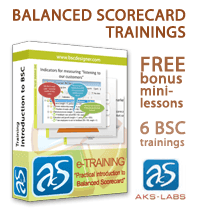 With new version of Balanced Scorecard Designer one could build a scorecard using a real data from training database. The new version of Balanced Scorecard Designer has a feature called “SQL Indicator”. With SQL Indicator user can access data from some database and use it as a value for indicator in balanced scorecard. This feature enables the integration between almost any business system and scorecard that user is designing. There are also some other possible integration ways, which third-party developers can use.